Stop Sending Me The Yellow Pages! And they are now listening. Hooray! 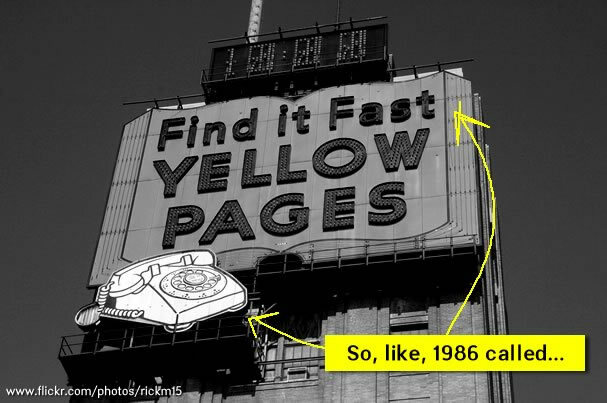 At least according to the Yellow Pages opt-out website, they seem to be doing something about it. I’m never really excited when I find the Yellow Pages at my doorstep, because it’s just an extra trip to the recycle bin for me, and it feels so damn wrong to be throwing away an over-sized booster seat worth of paper. Besides, with a smartphone and computer handy, like most folks these days, there’s much easier ways to get a phone number. If you feel the same way, it’s a quick two minute process to opt-out of the publication. I just did it, and it was totally painless. And in San Diego alone, you can opt-out of about a dozen publications that can litter your doorstep throughout the year. Thanks to Good.is for sending awesome stuff like this to my email so I can tell all you awesome people. Big hugs to the Earth. Thanks for sharing your thoughts on san diego design idea.